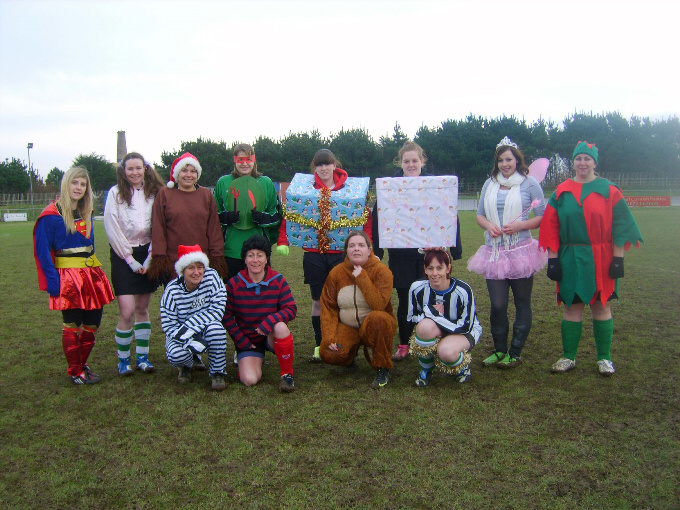 Sunday saw some strange visions at Enys Parc home of St Agnes AFC as members of the adult teams took part in the Annual Fancy Dress training session! Rachel Blackham was resplendent as a Super Hero Ninja Turtle whilst Kerry Penrose and Lisa Venton made excellent Christmas Presents, which did prove quite difficult to run around in! 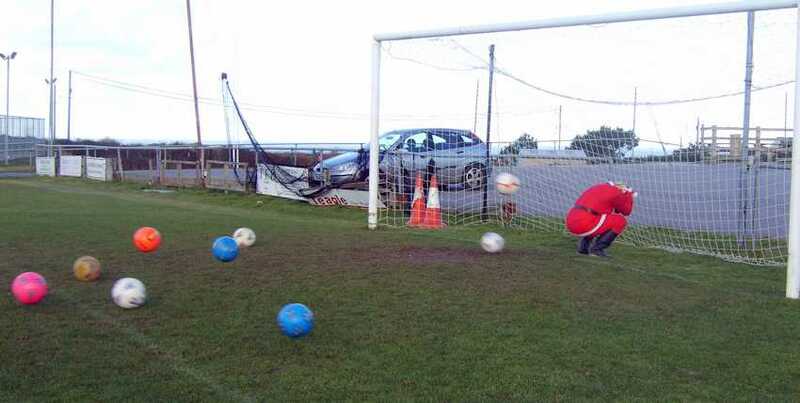 Member of the men's teams joined in as penalties were taken and corners were rehearsed. Club Chairman Mandy Kimmins commented "Every year we host this social gathering at Enys Parc and every one attending contributes subs towards a local cause. This year we collected £60 which will be divided equally between St Agnes AFC and Goonown Playing Field in St Agnes. We are fortunate as a club to be able to use this playing field for a few weeks as our pre-season training venue and it is important to us as a club that we try to put something back each year towards the hard work put in to up-keep the playing fields." 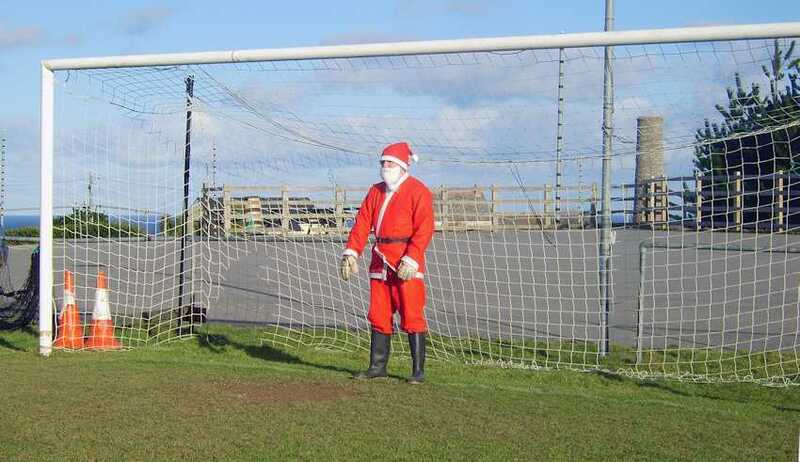 Saturday's mini-soccer at St Agnes AFC was extra special this week when a surprise visitor arrived at Enys Parc wearing his goalie gloves! 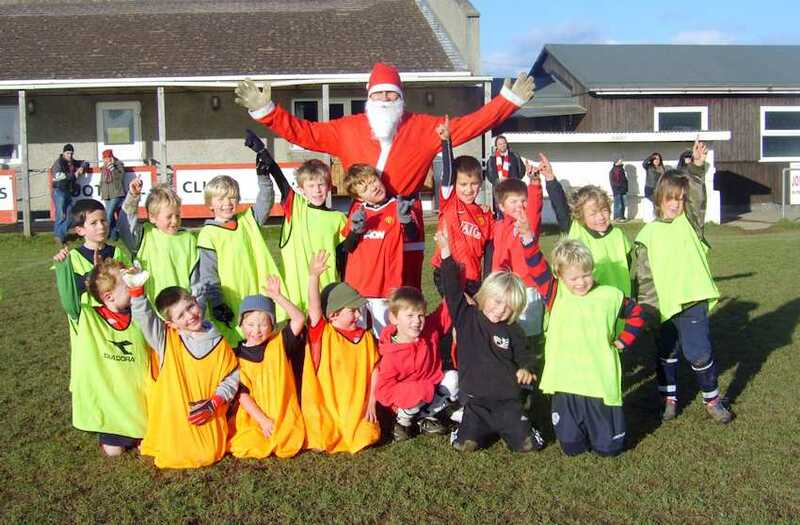 With much 'Ho, Ho, Ho-ing' Father Christmas joined in with a penalty shoot out much to the delight of the 20 children aged 4-7 years who couldn't wait for the opportunity to ‘beat Father Christmas'! 5 year old Wilf Slater was heard to gasp, "Santa's here!”. 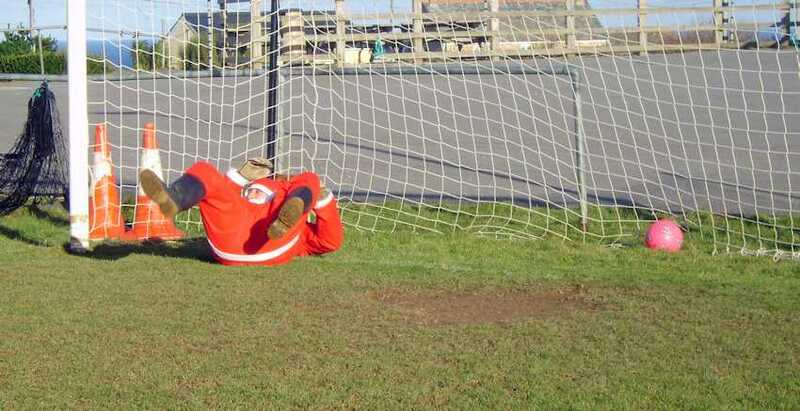 Sadly for Father Christmas he proved to not be very agile in the goal at all and despite his best efforts jumping around in his wellington boots and rolling around the goal mouth he didn't save any of the penalties! When all the children joined in to take a penalty at the same time he decided to huddle down and accept he was beaten! The children all enjoyed Christmas juices and biscuits while Father Christmas handed out sweets from his goody bag before the children all waved him off and wished him a safe journey. 4 year old Noah Teagle was thrilled to go home and report to his grandad, David Teagle that he had, "scored against Father Christmas”. St Agnes AFC Bolster Veterans hosted Plymouth Argyle Legends in a charity fixture at Enys Parc. An eagerly contested affair saw the former Plymouth Argyle players come out the winners at 3-1, but the goal of the match had to be that scored by St Agnes Bolster Veteran Simon Firth when, to the delight of the onlooking supportive crowd, he capitalised on a well placed ball from Dave Keverene to safely put the ball into the back of the net! Brave performances from the Aggie Bolster Vets saw the light feet of Plymouth Argyle Legends Chris Harrison who made 381 appearances in his career for Plymouth Argyle, John Uzzell (302), Leigh Cooper (323) and Martin Barlow (361) frustrate their efforts and ensure Argyle the victory! The charity of the day was chosen by Ladies team player Charlie Ward who asked for funds to be raised for 'Jeans for Genes' who had recently funded a conference in London around the rare genetic disorder Costello's Syndrome. Charlie with her husband Drustyn (also a member of St Agnes AFC) have two beautiful children Tassy and Samson who has Costello Syndrome. Drustyn was invited to 'guest' appear for the Plymouth Argyle Legends and was well supported and waved on throughout by Samson! Following the match a raffle and mini-auction took place raising funds of over £800 which will be split equally between Jeans for Genes and St Agnes AFC. Exhausted from his guest appearance Drustyn said, "Thank you so much to everyone for their efforts today, everyone's support has been fantastic!" St Agnes AFC Chairman Mandy Kimmins summed the event up by saying, "What a wonderful afternoon and what an amazing amount to raise! I am very proud of our own St Agnes Legends for their great efforts today! It was brilliant to welcome the Plymouth Argyle Legends to Enys Parc and I want to thank everyone for their support in every way! It was great to see Samson here waving his dad on so enthusiastically and I hope the money raised will help Jeans for Genes support other families like Charlie and Drustyn's"
Children from Costa Rica sent a clear self explanatory message to the members of St Agnes AFC this week in the photograph below. Earlier this season members of St Agnes AFC held a charity football match which raised over £700 for the Lady Gladys Education Centre in Costa Rica. Lady Gladys Education Centre was sent up by St Agnes man John Hawker and provides education for children living in poverty. 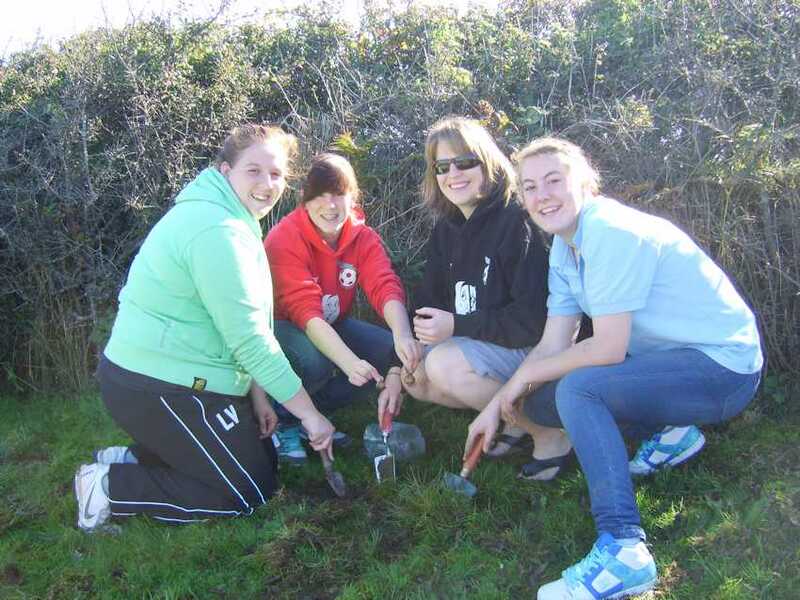 The money raised by St Agnes AFC is being used to support sport at the centre and in particular help fund drainage for the area used for the children to play football on. St Agnes AFC has historical links to this centre as family members have played for the club since the 1950's and still do in the present season. 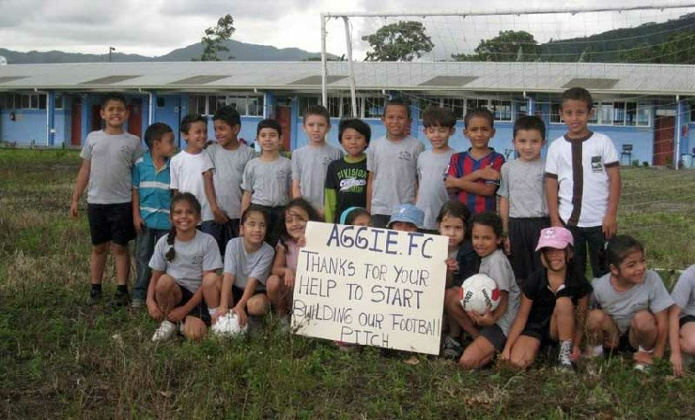 St Agnes AFC Chairman Mandy Kimmins said, "I am thrilled with this photo from Costa Rica it makes the children very real to me! I knew Gladys who the education centre is named in memory of. I know she would be thrilled with the fantastic progress that is being made there to provide what she believed was the most important gift you could give a child, and especially a poor child, which is an education! As a club we are now working towards providing some playing kit for the children most of whom live in poverty. It is very eye opening to look at the charities website and the photograph has inspired me to support further!" 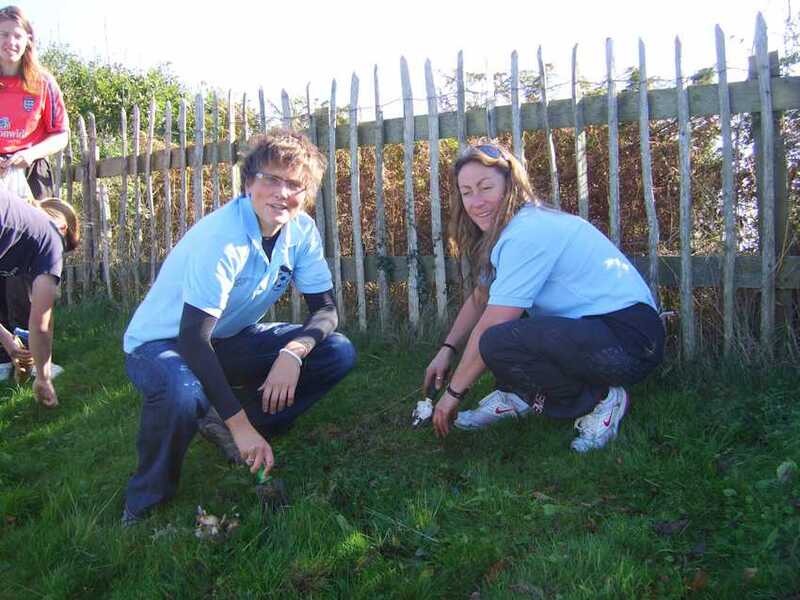 More than 200 people visited Enys Parc, St Agnes on Sunday and joined in with planting a bulb bank in memory of Sylvia Chapman former club player, ‘lino’, supporter, committee member, and founder member of the St Agnes AFC Ladies Team. Over 5000 bulbs including Daffodils, Tulips, Hyacinth, Crocus, and Snowdrops were planted and the sun beamed down as family members (led by her Sylvia's daughter Kelly and husband Henry) former players, current players, and friends spent an hour digging holes and trenches. 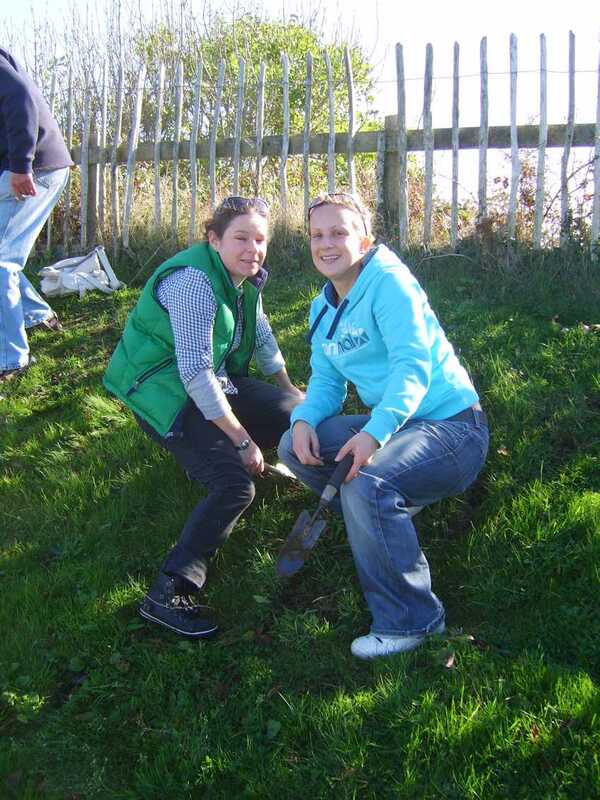 Former ladies team player Dr Alison Flanagan brought a bag of Daffodil Bulbs which she planted and commented, "I think this is a beautiful idea and my lasting memory of Sylvia is of her running the line for the Ladies Team. Where she used to run looks right out over where the bulbs are being planted so its just perfect!" Sylvia's husband Henry was moved and emotional as he greeted and thanked everyone for coming and said, "I cannot believe how many people have come and the number of bulbs is wonderful." 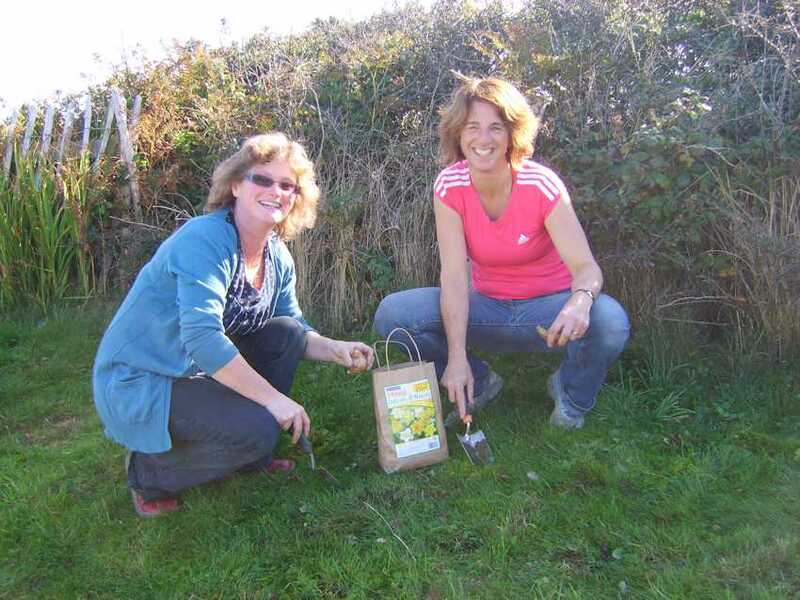 St Agnes AFC Chairman Mandy Kimmins summed the event up by adding, "Sylvia was a full of life character and I am really touched by how many people have supported the vision of planting a bulb bank as a living memory to her. 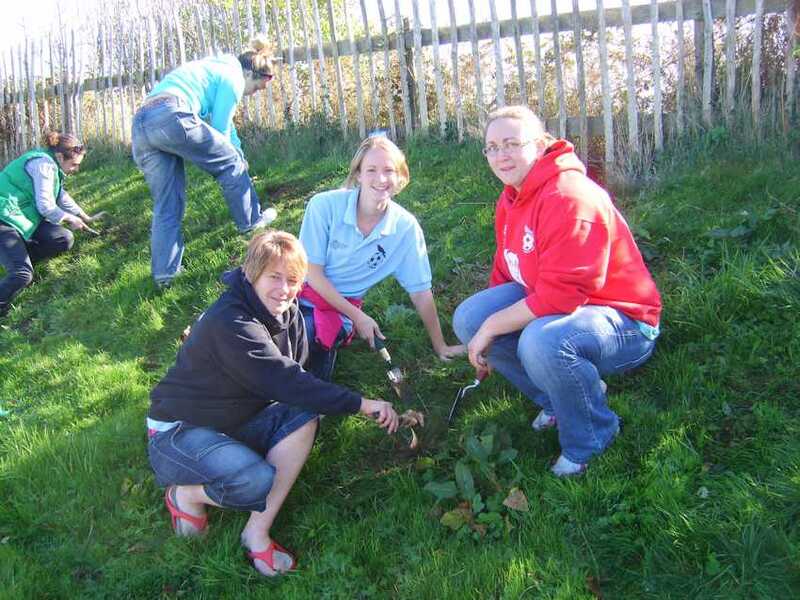 As well as all those who came today and joined in there are others who have sent bulbs, donated money for bulbs, asked for bulbs to be planted for them, and some are even coming on other days to plant some more! It has been a real outpouring of love, support, and respect for Sylvia and I want to thank everyone who joined in in every way! I cannot wait for the Spring now to see the result of everyone's efforts!" 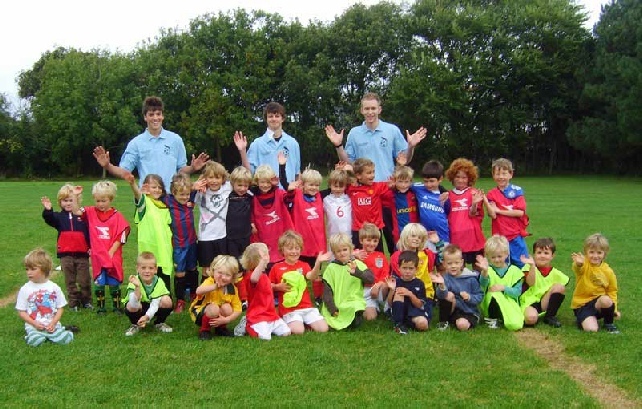 St Agnes AFC Mini Soccer School is up and running for the 2010/11 season and welcomed more than 30 boys and girls aged 5-7 years to their first session on Saturday. New head coach Tom Bartlett was delighted with the turn out and commented, "What a brilliant group of talented local children! I am really looking forward to working with them this season.” Club Chairman Mandy Kimmins said, "I am really grateful to St Agnes School for allowing us to host our mini soccer again. We are lucky to have such a great link there. This year we have three new coaches involved all of whom are players within the club and its great to see them want to step up and do their bit to put something back into the club and help develop the players of the future." Assistant coaches Sam Davis and Thads Vingoe are photographed with Tom Bartlett and most of the children who attended this seasons first session. St Agnes Mini Soccer School is held on Saturday mornings (postponed when wet) at St Agnes School and offers a turn up and play opportunity for boys and girls aged from 5-8 years. For more details please contact club Chairman Mandy Kimmins on 07974 370666 or check out the St Agnes AFC website. Sunday 29th of August saw a feast of family fun football as St Agnes AFC hosted a fun kick-about in aid of the Lady Gladys Education Centre in Costa Rica. Organised by the club as a mark of respect to former player of the 50's Donald Mitchell and his wife supporter Gladys the fun fixture involved several of their great grandchildren including Louis and Holly Keverene and Paul Dabell who are present playing members. The fun fixture was followed by a raffle, BBQ and mini-auction with the total proceeds reaching over £700! All proceeds from the event have been donated to the Lady Gladys Education Centre in Costa Rica which was set up by Gladys' son John Hawker in her honour and memory. John's daughter Kate and his granddaughter Holly are pictured during the football. 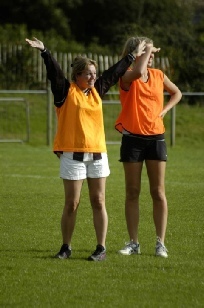 Kate Hawker commented "I cannot thank St Agnes AFC enough for organising and hosting this event! It was brilliant fun and the money raised will go along way at the Lady Gladys Education Centre to helping poor children in Costa Rica aged 4-7 years get a good education. At present the sports area at the school suffers from poor drainage so if it rains in the morning the area is not available for the children to use in the afternoon. Some of the money raised will be used to improve the drainage and the rest will be used towards purchasing some goals and footballs. 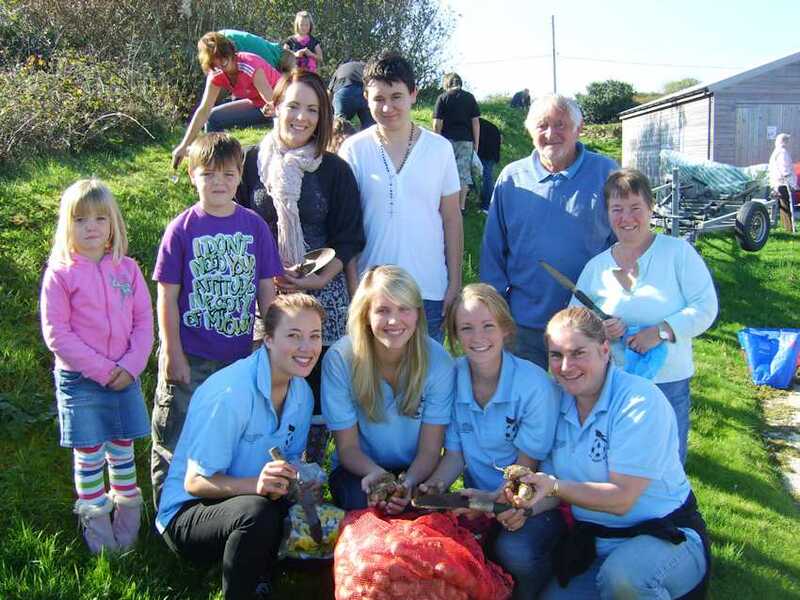 Gladys would've been delighted to see everyone joining in at Enys Parc St Agnes to help support the fantastic work at the school!" 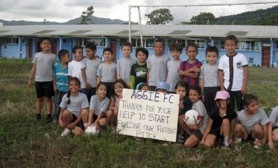 John Hawker from the school in Costa Rica commented, "I am thrilled with the support shown and money raised - thank you!" Mandy Kimmins Chairman of St Agnes AFC stated, "I am delighted with the support we received for this event and with the proceeds raised! As a club I feel St Agnes AFC has a link to The Lady Gladys Education Centre both historically through Gladys and Donald, but also across the years to the present date with their family members playing football for the club! I hope this will be the first of an annual event in support of the Lady Gladys Education Centre and we hope to be able in the near future to supply an appropriately sized set of St Agnes AFC shirts for the children to use!" 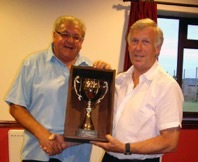 Retiring St Agnes AFC referee's assistant (Linesman) Ian Baxter received top marks from officials of the Jolly's Cornwall Combination League, and is photographed being awarded with the Whitford Trophy by Combination League Chairman Vidal James. 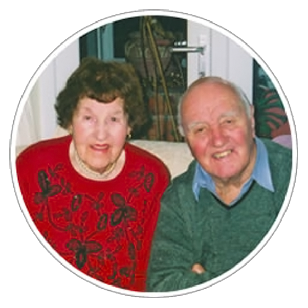 Ian and his lovely wife Mary have been stalwarts of the club since joining them several years ago and, whilst Ian has decided to hang up his line running boots and put down his flag, they will continue to valuable supporters. Club Chairman Mandy Kimmins said, "Ian has been a fabulous official, fair, reliable and efficient in every way! He has featured high in the referees points every year and it is completely fitting that he received the top accolade in his last season! During his time with us Ian bravely and successfully battled cancer and returned to his duties in even better form than before. We have been very lucky to have him and I will certainly miss seeing his knees running up and down the line at Enys Parc!" Ian has left a big hole to fill in his role as referee's assistant and St Agnes AFC would be delighted to hear from anyone interested in joining the club in this capacity, courses would be provided if necessary. Please contact Mandy Kimmins on 07974 370666. St Agnes AFC held their first ever Garden Party in the beautifully revamped garden at the Railway Inn, St Agnes on Saturday. With cream teas and an enormous mountain of home-made cakes on offer trade was brisk and Victoria Sponges, iced buns, cupcakes and rock buns flew off the stall like 'hot cakes'! The highest value was raised by a tin of homemade flapjacks which raised a whopping £10 and the best value was from a gorgeous creation of a lemon and poppy seed ring which was made by Marina Harvey and bought back by her husband Bernard who had also just presented the club with a generous cheque of £200 to sponsor the St Agnes AFC Under 18's Team for the forthcoming season! Supporters Lucy Williams and Kate Randalls ran the Apple Bobbing and a huge tombola stall also proved popular! The raffle was well supported and the total raised from the two hours spent in the garden and the Railway Inn was a fantastic £350. The proceeds are to be split evenly between St Agnes AFC and Costello Kids which is a charity offering support and raising awareness of a rare syndrome called Costello Syndrome. St Agnes AFC Chairman Mandy Kimmins said “What a fabulous afternoon, raising £350 in 2 hours is fabulous. I would like to say thank you to the Railway Inn for allowing us to use their garden and to everyone who has supported in every way. Half the proceeds from today will be used within St Agnes AFC, but more importantly half will be donated to Costello Kids an inspirational charity set up by the parents of Heliena Stone who was the 23rd person in the world to be diagnosed at 3 months old with Costello Syndrome. Heliena is now 16 years old and a winner of bravery awards!" 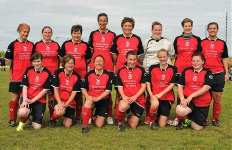 St Agnes Ladies hosted their second Ladies seven aside football Tournament on Sunday 18th July at Enys Parc and were thrilled with the response with 22 Ladies Teams entering. The competition was played across three pitches and saw all teams play 9 fixtures competing for three separate trophies. A varied mix of abilities saw both experienced high flight teams from Plymouth Argyle Ladies, Newquay Ladies, Totnes, and Dartington playing on pitches next to the best of Cornish Ladies Teams from Torpoint and Bude, and ladies teams playing within the Cornwall Women's Football League (including this years new club Trevenson). The Tournament Winners Cup was eagerly contested between Newquay and Falmouth, with Newquay narrowly lifting the silverware. The Supplementary Cup Final was between Marine Acadamy and Truro Ladies with penalties needed to decide the winners as Marine Acadamy. The Printout Trophy saw Torpoint lift the silverware in a great spirited final over host club St Agnes Ladies. St Agnes AFC Chairman Mandy Kimmins said, "I am absolutely thrilled with the response and attendance at our 2nd Ladies Tournament. I am delighted at the ever growing interest there is in female football across the county and I would really like to thank all the clubs who entered, the 5 referees who freely gave their time to this event, and everyone else who supported and sponsored it along the way!" 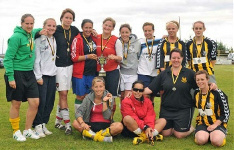 The proceeds from the Tournament will be divided equally between Cancer Research UK (St Agnes Branch) and St Agnes AFC. 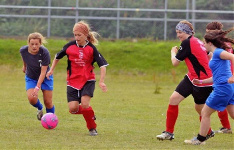 St Agnes AFC Ladies are now back in training on Wednesday evenings and would be delighted to hear from any women 16 years and over of any ability who would like to join their squad for the forthcoming 2010/11 season of football, fitness and fun! Please contact Mandy Kimmins 07974 370666 or email bolsterpaper@gmail.com. St Agnes Sports Club played host to a fixture of two very distinct halves when a select gathering of members of St Agnes AFC and St Agnes RFC met together for a pre-season fitness fixture involving both sports. The ensuing fixture proved to be a mixture of both great sporting prowess and hilarious misjudgements as football players dropped rugby catches and rugby players air-kicked footballs! An excellent fitness run out for both clubs with the only win for either side being the £180 collected from match subs and a raffle to be divided equally between the NSPCC (St Agnes Branch) and St Agnes Sports Club supporting Sport in the Parish. 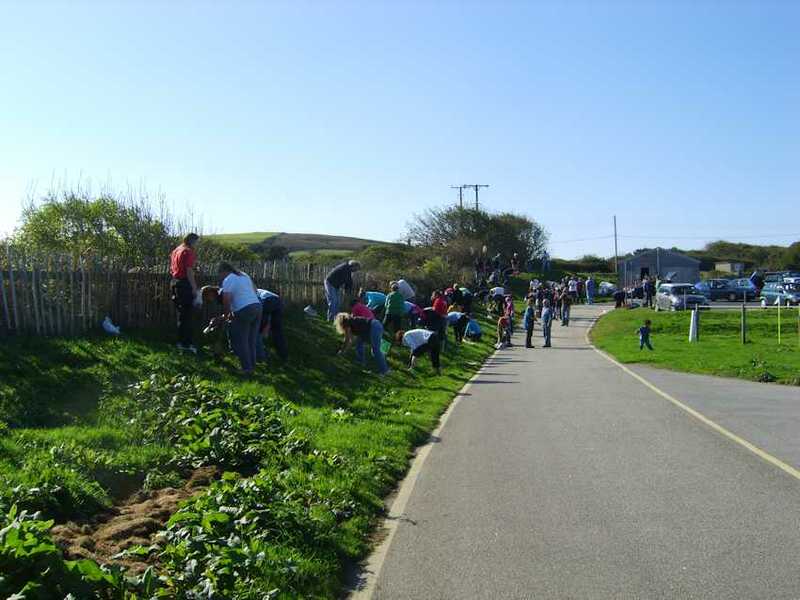 St Agnes Sports Club Chairman Mandy Kimmins commented, "I hope this will become an annual feature in the St Agnes Sports Club calendar, great fitness and great fun from two great St Agnes Clubs!" 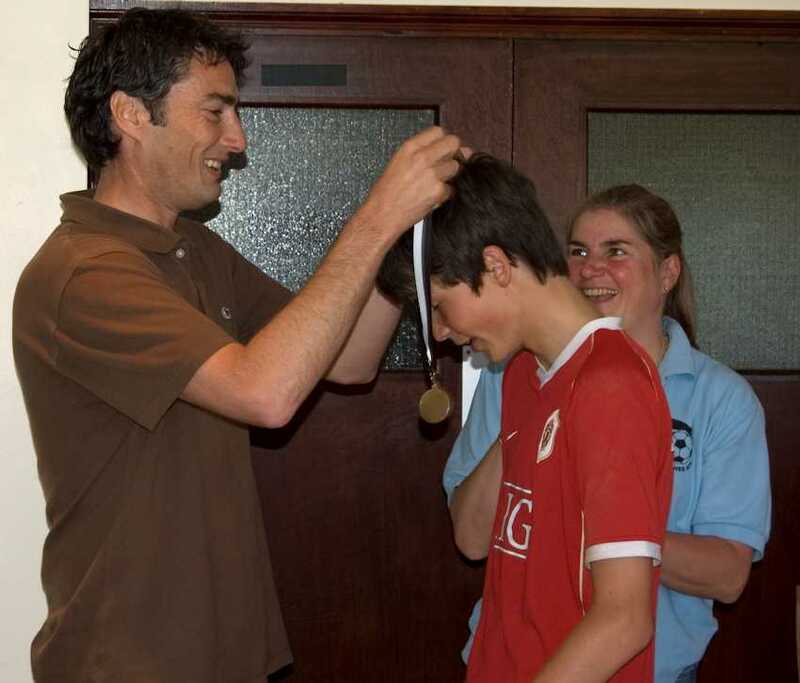 Sunday 23rd May 2010 saw the Under 15’s and Under 16’s End of Season Presentations at Enys Parc. The days was gloriously sunny and kicked off with a U15 -v- U16 friendly. This was loosely 11-a-side with managers and coaches joining in what was a relaxed and occasionally funny game in the sun. The BBQ was fired up afterwards with all the boys bringing something to cook, and a generous donation of burgers and sausages from Dobles Foods. The presentations went well, and all the boys are a credit to their Club. Special thanks must go to Andy Brown’s parents, and Harvey Lawrence’s parents for their help with the BBQ and raffle. The raffle was excellent with a host of prizes, and we raised £140 (half of which will be donated to St Agnes Scout Group). We would like to say a big thank you to all the people and organisations that donated a raffle prize - it really is much appreciated. Thanks also to Julie for opening up the Club bar. Special thanks also to Nigel Brabyn for the years of time and effort he has put in with the Under 15’s, and similarly to Gary Springall for his work as the Under 16’s manager. The managers also said thank you to the people behind the scenes who helped throughout the season (you know who you are). Both managers are stepping down next season and the boys put together to buy them both farewell gifts. 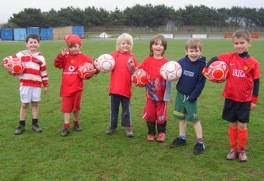 On Saturday St Agnes AFC min-soccer school hosted their own mile for Sport Relief at a drizzley, mizzley wet Enys Parc. Undaunted by the weather the boys lined up with their parents, friends and supporters to complete 5 laps of Enys Parc - technically measured out to meet the one mile requirement! All the boys aged 5 and 6 years had been asked to turn up wearing something red and Angus who bravely declared on his arrival "I am wearing everything red except my pants!" was quickly picked as the winner of the red ball prize for the child wearing most red! On the blast of the whistle George set off at a very quick pace closely followed by Ethan leaving many of the parents behind. 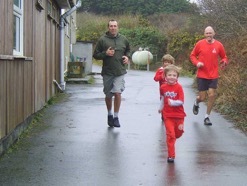 Five year old Cameron is pictured outpacing his dad, and Callum and Angus are pictured easily out running theirs. All of those taking part put in a tremendous effort with Reece winning the red ball prize for showing some extra special enthusiastic running. The fifth and final lap proved the most exciting and popular when it was revealed to be not only a backwards lap of the course but also a surprise early Easter Egg Hunt with eggs hidden around the ground for all the children to find. A penalty shoot out with parents followed, the children taking the victory. 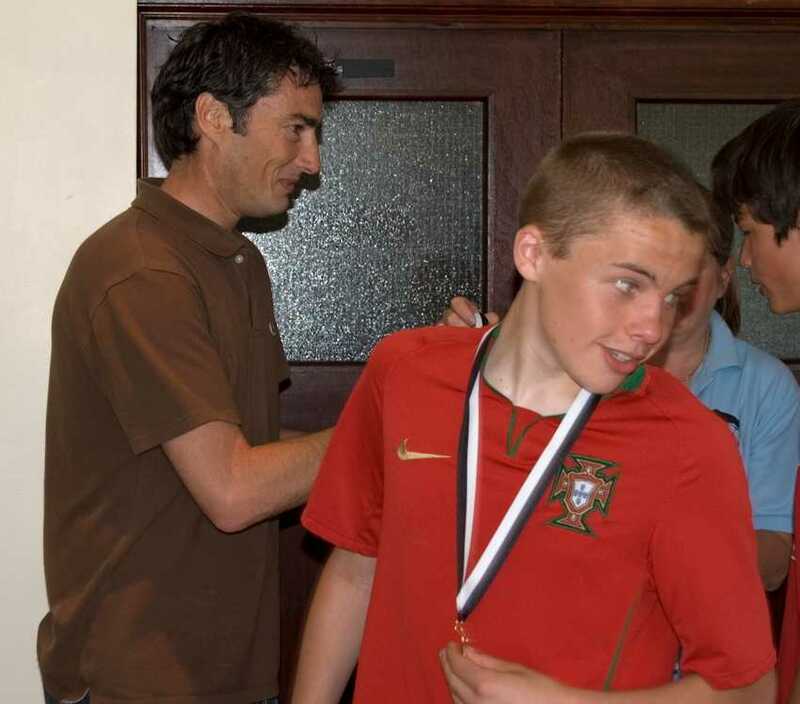 As the children tucked into a party spread of food, their coach and Club Chairman Mandy Kimmins explained that the monies the squad had raised in sponsorship totalling £200 would be used by Sport Relief, half in this country and half abroad, to help others less fortunate than themselves. 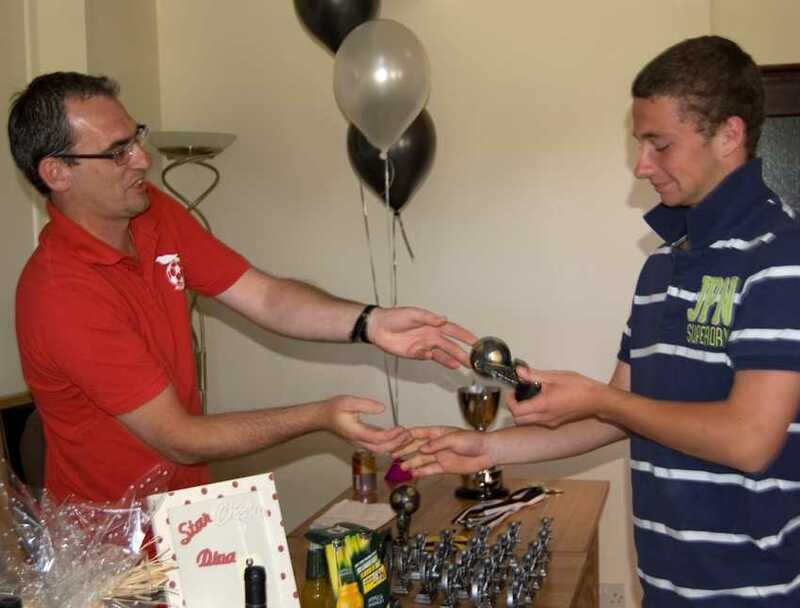 George was presented with the St Agnes AFC Sport Relief red ball prize for collecting the most sponsorship. Aaron, Reef, and Hank were also presented with balls for their recent improvement and growing confidence as mini-soccer. Mandy Kimmins commented "I really want to congratulate this super group of talented mini-soccer players. They have entered into today's event with wonderful enthusiasm and vigour. 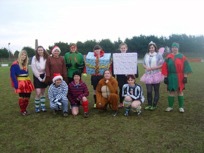 St Agnes AFC is very proud of them and the effort they have made to raise such a lot of money for Sport Relief." 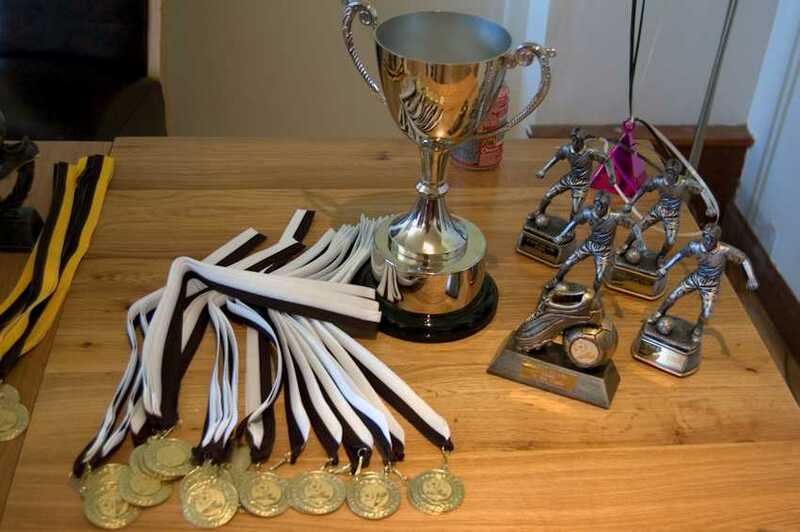 St Agnes AFC mini-soccer meet on term-time Saturday mornings at St Agnes School and would love to meet and boys and girls aged 5/6 years interested in joining their enthusiastic squad, for more details please call Mandy Kimmins on 07974 370666. St Agnes AFC mini-soccer team welcomed Perranwell AFC minis to a round-robin of fixtures on Saturday hosted at St Agnes School. 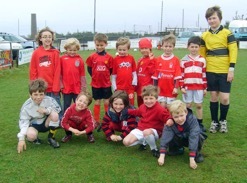 With 25 minis aged 5 & 6 years of age taking part the football was exciting, entertaining and energetic! Perranwell manager Simon Fisher praised both teams of boys saying, "What a fabulous morning for some great football. St Agnes School is a great venue for the children to play at thank you to St Agnes AFC for organising it!" St Agnes AFC manager Mandy Kimmins commented, "What a privilege it is to see the next generation of footballers taking part with such enthusiasm and good spirit!" With goals being scored and excellent skills being demonstrated, hands being shaken, and load cheers all around, the success of the morning was clearly visible on 25 young faces as they tucked into refreshments and drinks. St Agnes AFC mini-soccer meet every term-time Saturday morning between 9.45am and 11am and would love to meet any new 5 & 6 year old boys or girls who would like to join their squad. Please contact Mandy Kimmins on 07974 370666. 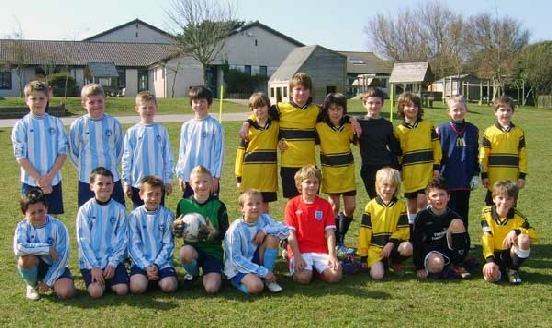 Following the mini-soccer round robin St Agnes AFC Under 10's team hosted Chacewater Under 10's for a friendly fixture. The St Agnes boys found themselves under pressure from a strong Chacewater team, but proudly and determinedly battled on until the final whistle despite the scoreline going against them. St Agnes AFC Under 10's are presently a friendly team only, but hope to enter into the Kernow League next season and would be interested in hearing from any Under 10's interested in joining their friendly progressive squad. They would also love to hear from any other Under 10 teams interested in playing them in a friendly fixture. Please contact St Agnes AFC Chairman Mandy Kimmins on 07974 370666.